While “Animal House” was based on a Dartmouth fraternity, the school has made great strides in moving away from this image. You may have come across a “Rolling Stone” article published yesterday about Dartmouth College fraternities. We won’t be linking to the piece in this post as there are parts that are rather repulsive. Specifically, the article focuses on a disgruntled and deeply troubled student, Andrew Lohse, who makes allegations that there is serious hazing going on in the fraternities of Dartmouth. As you may know, the infamous movie “Animal House” was based on Dartmouth College’s Alpha Delta fraternity, but this is an image the school has made great strides in moving away from. 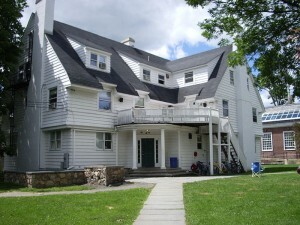 Are fraternities huge at Dartmouth? Yes. Is there hazing at Dartmouth? We’ll let you answer that. But let’s just say that if there are fraternities on campus — regardless of the college campus — there is hazing. Now, don’t get us wrong…hazing is awful and it should stop. It should be rooted out at each campus across this nation and if this article helps to jumpstart that movement, then something good came out of it. But it exists across the colleges and universities of this nation. That’s not an excuse. But we’re just saying that it shouldn’t be a surprise. The allegations of this whistleblower who clearly has an axe to grind with the school that is coming down on him for participating in the alleged hazing events shouldn’t be perceived as some great revelation. Was it a great surprise when a whistleblower at Goldman Sachs revealed that Goldman execs are out for money at the expense of their clients? How is that newsworthy? Sure, the ex-employee with an axe to grind got front page real estate in “The New York Times,” but seriously? How is it surprising that Wall Street execs are out for money? Why was this a noteworthy op-ed? That’s like a cigarette exec coming forward at this point (in 2012) and saying that cigarettes cause cancer. Of course they do. We’ve known this for years. And, yes, the commendable whistleblower Jeffrey Wigand did contribute to outing the cigarette companies. Whistleblowers can be fantastic for society. The world can indeed be changed by the power of one…which is an important lesson. Jeffrey Wigand is such an example. He bravely stood up to the cigarette companies at great personal sacrifice. But Andrew Lohse, this naive and entirely bitter former Dartmouth student, doesn’t come across as a courageous whistleblower in the “Rolling Stone” piece. Andrew Lohse comes across as a vindictive young man with a serious drug problem who has tried desperately to tarnish the reputation of the finest school in America for all the wrong reasons. Shame on him. Nonetheless, if anything good can come out of his allegations, we hope students think twice before they resort to undignified acts to their fellow students in frat basements.